On occasion, it is very enjoyable to spoil yourself by staying at a first-class hotel and playing a PGA golf course. Starr Pass Resort in Tucson more than qualifies to meet this experience. Starr Pass Resort and Spa is located 10 kilometres (six miles) west of downtown Tucson, Arizona, and six kilometres (four miles) off Interstate 10. The name comes from Richard Starr who built a stagecoach trail through the Tucson Mountains in 1884, which is now part of the Tucson Mountain Park. Operated by the J.W. Marriott chain, this resort is a massive complex with a hotel and a championship PGA golf course. Construction of the three nine-hole courses dates back to 1986, but the present configuration was completed in 2003. Starr Pass is an Arnold Palmer course, with Bob Cupp, Ed Seay and Craig Stadler all making design contributions. The sixth fairway of the Coyote course is the original Starr Pass Trail and now serves as the signature hole for the three courses. The greens are bent grass and the fairways Bermuda grass. 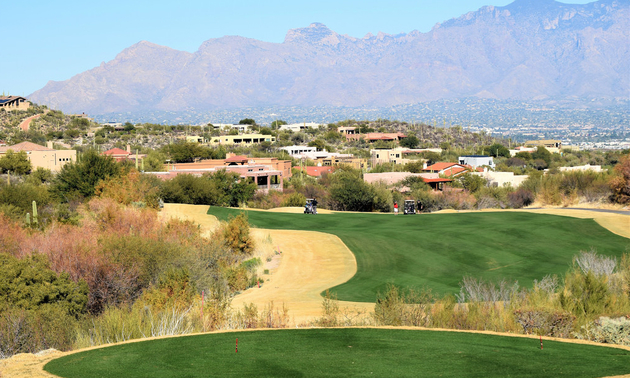 The three courses wind through the Tucson Mountains and arroyos flanked by rocky bluffs. Natural hazards are left in strategic places, forcing either blind shots or precise shots over the hazards. This is the Sonoran Desert with the natural habitat consisting of saguaro, barrel and ocotillo cacti, along with ironwood, palo verde and mesquite trees that seem to eat golf balls. The greens are large, undulating, tiered and elevated. The fairways have wide landing areas but take a drop and stroke out of the desert rough. Because Starr Pass is located in the mountains, wildlife is often seen, including coyotes, roadrunners, javelins and rabbits as well as a herd of deer that occupies the sixth and seventh holes of Rattler. Golfers are constantly reminded to play the appropriate tees. That means staying off the back tees, unless you have a single handicap or better. A good option at Starr Pass is to play the Men’s Hybrid holes, where the tees will vary from the longer Gold Championship tees to the easier Silver tees. As a result, a golfer has a taste of playing from where the pros tee off. The average Men’s Hybrid has a course rating of 70.2 with a slope of 132, which provides an added challenge. Only the Roadrunner could be described as a resort course, being shorter with generous fairways. This is a full-service golf course with driving range, practice area, club house, lessons, well-equipped pro-shop and dining room. The golf course offers discount pricing to children, college students and military personnel. Cheaper green fees can be booked online through Golf Now. Starr Pass achieved some notoriety when Phil Mickelson won his first PGA Tournament here in 1991 while still an amateur at Arizona State University in Tempe, Arizona. Mickelson also became a local legend by shooting a 13 on the fifth hole, par 5, 510 yards on the Rattler course. My bogey on that hole felt extremely satisfying. 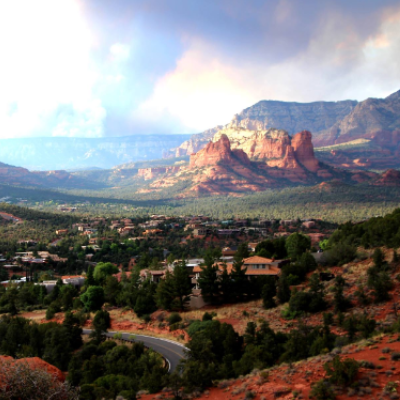 Starr Pass is much more than just a golf course—it is an upscale resort. There are 575 rooms, including luxury golf suites. The rooms have deluxe amenities, stunning views, comfort and elegance. There are meeting rooms, three swimming pools, two ballrooms, six restaurants and ample space to hold large conventions or weddings. The Hashani Spa includes ancient healing treatments, therapy baths, manicures and pedicures, massages, steam room and a complete fitness centre. With a 4.6/5 rating from Real Stays, the resort is first class, while the golf course is rated No. 12 in Arizona by Golf Advisor Magazine. There are numerous activities other than golf, including all levels of hiking trails, mountain biking, tennis, water tubing on the Lazy River and horseback riding. Only a short distance away is the Saguaro National Park (West), Old Tucson Studios and the Arizona-Sonora Desert Museum. There is no shortage of activities to experience while staying here. The Stay and Play Packages provide an escape into luxury, both on and off the course. One activity that drew my attention takes place every evening at 5:30 p.m. All guests who assemble on the Salut Patio receive a complimentary Tequila Toast drink. What a great way to end a round of golf . . . no matter what the score!